David Watson, who had recurring roles on the TV shows Rawhide and Never Too Young, died on 5 October 2014 at the age of 74. The cause was a heart attack. David Watson was born in Austin, Texas on 10 March 1940. His parents moved to London not long after he was born. At a young age he was a choirboy at Westminster Abbey and even sang at the Coronation of HRM Queen Elizabeth II in 1953. As a teenager he became a professional singer and performed in nightclubs and cabarets. He later turned to acting, initially on stage. He made his television debut playing the regular role of Ian Cabot in the final season of the TV Western Rawhide. He was also a regular on the teenage soap opera Never Too Young that aired on ABC-TV in 1965 and 1966. In the late Sixties he guest starred on such shows as The Girl from U.N.C.L.E., The Time Tunnel, Petticoat Junction, Rowan & Martin's Laugh In, and Daniel Boone. In 1968 he starred in a television musical version of the Robin Hood myth entitled The Legend of Robin Hood alongside Douglas Fairbanks Jr. and Roddy McDowall. He made his film debut in 1970 playing Cornelius in Beneath the Planet of the Apes. Due to a scheduling conflict, Roddy McDowall was unable to play the role he had originated in the first movie and as a result Mr. Watson got the part. He also appeared on the British stage in The Great Waltz. In the Seventies David Watson guest starred on the TV shows Charlie's Angels, The Bionic Woman, and Project U.F.O. He appeared on the British stage in R Loves J. In 1979 he became a talent agent with the White Light agency. Mr. Watson returned to acting a few times over the years. He appeared in the films Beyond the Next Mountain (1987), Headless! (1994), Lucky Break (1994), and Criminal Ways (2003). He appeared in the TV movies Perry Mason: The Case of the Lady in the Lake and My Brother Jack, and guest starred on the TV show Good Guys Bad Guys. Warren Clarke, who played Dim in A Clockwork Orange (1971) and Detective Superintendent Andy Dalziel on the TV show Dalziel and Pascoe, died on 12 November 2014 at age 67 after a brief illness. Warren Clarke was born Alan James Clarke on 26 April 1947 in Oldham, Lancashire. After leaving school at age 15 he started work as a copy boy at the Manchester Evening News. He performed as an amateur at the Huddersfield Rep and the Liverpool Playhouse before taking up acting full time. It was at this time that he took "Warren Clarke" as a stage name. Mr. Clarke made his television debut on ITV Play of the Week in 1966. In the Sixties he went onto appear on television in such programmes as Pardon the Expression, The Avengers, Coronation Street, On the Rocks, and Callan. He made his film debut in an uncredited, bit part in The Virgin Soldiers (1969) and appeared in a role in The Breaking of Bumbo (1970). In 1971 he appeared as Dim in Stanley Kubrick's controversial film A Clockwork Orange. In the Seventies he would appear in such films as Antony and Cleopatra (1972), O Lucky Man! (1973), The Great Riviera Bank Robbery (1979), Victims (1979), and Hawk the Slayer (1980). He had regular roles on the TV series Softly Softly: Task Force, Jennie: Lady Randolph Churchill, Our Mutual Friend, and The Onedin Line. He appeared on such shows as Six Days of Justice, Armchair Theatre, The Sweeney, Z Cars, and Hammer House of Horror. In the Eighties Warren Clarke guest starred on such shows as Tales of the Unexpected, Crown Court, Bergerac, All Creatures Great and Small, and Black Adder the Third. He was a regular on the series Shelley, The Home Front, The Jewel in the Crown, Wish Me Luck, Nice Work, and The Manageress. He appeared in the films From a Far Country (1981), Firefox (1982), Enigma (1983), Real Life (1984), Lassiter (1984), Top Secret! (1984), Ishtar (1987), and Crusoe (1988). In the Nineties Mr. Clarke was a regular on the TV shows Sleepers, All Good Things, Gone to the Dogs, The Secret Agents, Gone to Seed, Conjugal Rites, The House of Windsor, Moving Story, and Down to Earth. It was in 1996 that he began his long run as Det. Supt. Andy Dalziel on Dalziel and Pascoe. He guest starred on Lovejoy and In the Red. He appeared in the film I.D. (1995). In the Naughts Warren Clarke continued to appear on Dalziel and Pascoe and Down to Earth. He also appeared in the mini-series Bleak House and the TV series The Invsibles. He guest starred on the shows Agatha Christie's Marple and Inspector Lewis. He appeared in the films Blow Dry (2001), Arthur's Dyke (2001), and The Man Who Married Himself (2010). In the Teens Mr. Clarke was a regular on the TV shows In with the Flynns and Chugginton. He guest starred on the shows Midsomer Murders, Inspector George Gently, Just William, Wild at Heart, and Call the Midwife. He starred in the series Poldark, set to air next year. 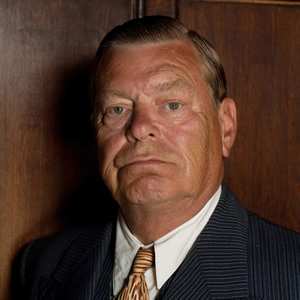 Warren Clarke was a very versatile actor. 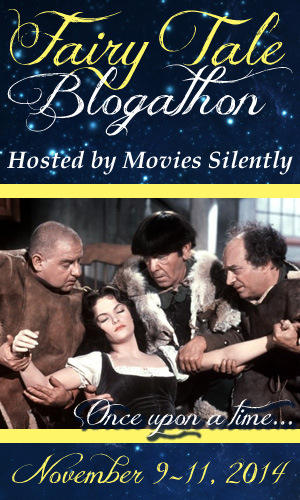 He appeared in a wide variety of films, everything from dystopic science fiction (A Clockwork Orange) to Shakespeare (Antony and Cleopatra) to low budget sword and sorcery (Hawk the Slayer). He also played a wide variety of roles over the years, from the overly camp "Sophie" Dixon in The Jewel in the Crown to the rather old fashioned and even downright sexist Dalziel in Dalziel and Pascoe. Regardless of the film or television show in which he was appearing or the role he was playing, Warren Clarke always gave a good performance. His was a great talent whose career was cut all too short. It was 75 years ago today, on 10 November 1939, that Flash Comics #1 (January 1940) hit newsstands in the United States. To say Flash Comics #1 was a very historic issue would be a bit of an understatement. First, it was the first comic book published by All-American Publications (one of the companies that would form the modern day DC Comics) to feature superheroes. Second, and perhaps more importantly, it featured the first appearances of such characters as Hawkman, Johnny Thunder, and The Whip. By far the most important character to make his first appearance in Flash Comics #1 was The Flash. Not only was The Flash was the first superhero with super-speed as his power, but he also proved to be one of All-American's most popular characters. He was also one of the founding members of the first superhero team in comic books, the Justice Society of America. In a roundabout way it was also The Golden Age Flash who would spark the Silver Age of Comic Books in 1956. Flash Comics was published by All-American Publications, a company that grew out of National Allied Publications (publisher of Superman) and Detective Comics Inc. (publisher of Detective Comics, the eventual home of Batman). The company was founded by Max Gaines, who had played a large role in the creation of the very first American comic book, and Jack Liebowitz, who with Harry Donenfeld was co-owner of National Allied Publications and Detective Comics Inc. Max Gaines, who had been working for the McClure Syndicate, wanted to form his own company. To do he sought financing from Harry Donenfeld. At the same time Jack Leibowitz was anxious to expand beyond the four titles his companies were currently publishing. Mr. Donenfeld was not particularly anxious to do so, feeling the company already published enough comic books. Harry Donenfeld then killed two birds with one stone. He provided Max Gaines with the money to start All-American Publications on the condition that he take Jack Liebowitz on as a partner. All-American Publications was technically a separate company from National Allied Publications and Detective Comics Inc., with its own offices at its own address. Despite this, characters from National Allied Publications and Detective Comics Inc. were promoted in All-American titles and vice versa. Furthermore, for most of its history All-American titles would bear the informal DC logo or "bullet" that National and Detective Comics titles did. 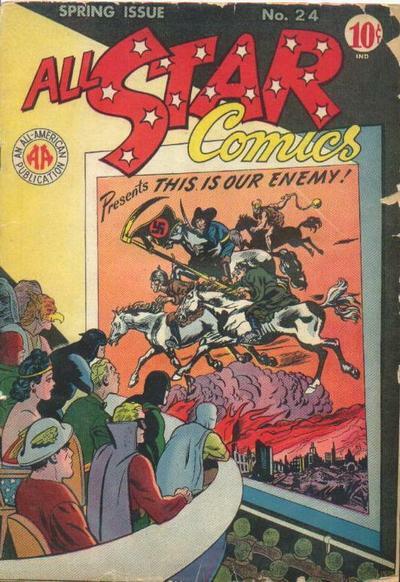 All-American Publications' first title was All-American Comics, its debut issue having a publication date of April 1939. That first issue of All-American Comics, like many of All-American's titles, published a mixture of newspaper reprints and original material, including popular aviator character Hop Harrigan. The continued success of Superman and the emergence of other superheroes such as Batman made it inevitable that All-American Publications would have to start publishing superheroes, even though Max Gaines was not particularly fond of the genre. It was then that All-American published its first title to feature superheroes, Flash Comics #1, in November 1939. While Flash Comics was an anthology title that featured several characters and was not devoted exclusively to him, The Flash soon became the most popular character in the title. The Flash was created by legendary writer Gardner Fox and artist Harry Lampert. Mr. Fox had been inspired by the Roman god Mercury, known for his great speed. Reflecting Gardner Fox's inspiration, Harry Lampert based The Flash's costume on Mercury, complete with a winged helmet and winged boots. The Flash was Jay Garrick, a science major attending an American university at the time he gained the power of super-speed. Jay did very well in his classes and even worked with Professor Hughes in his studies on "heavy water." Unfortunately, Jay was not nearly so successful in his other pursuits. Although a member of the football team, he spent more time on the bench than on the gridiron. His love life was not much better. Joan Williams spurned him for the captain of the football team. Fortunately for Jay, his luck was about to change. Working on an experiment in the lab late at night, Jay knocked over some heavy water and other chemicals. Overcome by the fumes, Jay lay there for hours until he was discovered by Professor Hughes. Hughes immediately rushed Jay to the hospital, where he lay for weeks in a coma. When Jay finally came to, the physicians at the hospital told Hughes that tests on Garrick indicated a highly accelerated metabolism. He said that Jay would be, "the fastest thing to ever walk the earth!" It was not long after his release from hospital that Jay learned he could move at super speed. When he saw Joan getting on a bus he was able to catch up to her in less than a second. Jay tested the extent of his powers and, for the first time in his life, led the football team to a win through the use of a bit of his super speed. It was later that Jay decided to put his powers to good use and assumed the identity of The Flash. Shortly thereafter Joan visited him with the news that her father had been kidnapped by a gang calling themselves the Faultless Four. Using his super speed, The Flash was able to rescue him. The Flash proved popular from his first appearance in Flash Comics #1, and it was not long before he was appearing in other titles. He was one of the characters featured in All Star Comics #1, summer 1940, an anthology title that featured characters from both All-American Comics Publications and Detective Comics Inc. With All Star Comics #3, winter 1940-1941, The Flash became one of the founding members of the Justice Society of America. So popular was The Flash that he eventually received his own title All-Flash, the first issue cover dated summer 1941. He was also one of the characters featured in Comic Calvacade (the first issue was cover dated December 1942), which featured All-American's most popular characters: The Flash, Green Lantern, and Wonder Woman. So popular was The Flash that at one point he was appearing in four different magazines: Flash Comics, All Star Comics, All-Flash, and Comic Cavalcade. The Flash inspired imitators as a number of high-speed superheroes followed in his wake. The first such imitator appeared only two months after The Flash's appearance, The Silver Streak in Silver Streak Comics #3, February 1940 published by Your Guide Publications (The Silver Steak could not only run fast, he could fly...literally). A third super-speedster was Quicksilver (not to be confused with the Marvel character of the same name), who debuted in National Comics #5, November 1940, published by Quality Comics. The company that would become the modern day Marvel Comics introduced their own super-speed hero, The Whizzer, in USA Comics #1, August 1941. Even All-American Comics' sister company, Detective Comics, would come out with a super-speedster, Johnny Quick in More Fun Comics # 71, September 1941. Of course, none of them ever surpassed the original in popularity. Over the years The Flash would also develop his own rouge's gallery. His first super-powered opponent was The Shade, a villain capable of manipulating shadows who first appeared in Flash Comics #33, September 1942. Unfortunately, The Shade would not appear again until 1961. It was only a few months later in Flash Comics # 36, December 1942, that The Flash fought The Rag Doll, a villain gifted with extreme flexibility (he was said to be triple-jointed). Like The Shade, The Rag Doll would not appear again for decades. While The Shade and The Rag Doll only fought The Flash once during the Golden Age, other supervillains fought him multiple times. Among these was The Thinker . Equipped with his "Thinking Cap", which could project psychic force, he first appeared in All-Flash #12, Fall 1943. Another recurring villain was The Fiddler, who played a fiddle that could control minds, create force fields and even shatter objects. He first appeared in All-Flash #32, December 1947-January 1948. Among the enemies The Flash faced more than once during the Golden Age was one of the rare female supervillains of the era. The Thorn was the alter ego of Rose Canton, a woman with dissociative identity disorder. Not only did she have fairly extensive knowledge of botany, but she was also able to control plants. She first appeared in Flash Comics #89, November 1947. Although The Flash was a founding member of the Justice Society of America, he would be absent from the feature for part of the Forties. It was a policy at the time that once a character received his own title, he would no longer appear as part of the Justice Society of America. Having received his own title in the formof All-Flash, The Flash stopped appearing in All Star Comics with issue #7, October-November 1941. The Flash returned to the Justice Society of America in All Star Comics, #24 spring 1945 and remained in the feature until it ended with All-Star Comics #57, March 1951. The Flash's return to All-Star Comics emerged from a period of estrangement between All-American Publications and its sister company Detective Comics. Co-owners Max Gaines and Jack Liebowitz found themselves increasingly at odds, to the point that All-American broke away from Detective Comics Inc. For a time All-American titles were published with the company's own "All-American" logo. At the same time various Detective Comics characters stopped appearing in All Star Comics as members of the Justice Society of America. To fill their spots, The Flash and Green Lantern (who had also stopped appearing in the title with All-Star Comics #7, October-November 1941) returned to the Justice Society of America. Max Gaines eventually sold his part of All-American Publications to Jack Liebowitz, who then merged it with Detective Comics Inc. This merger would lead to the company National Periodical Publications, which was eventually renamed DC Comics (the name by which it had been informally known for decades). Following World War II the popularity of superhero comic books went into decline. Several superhero titles were cancelled, among which were titles featuring The Flash. 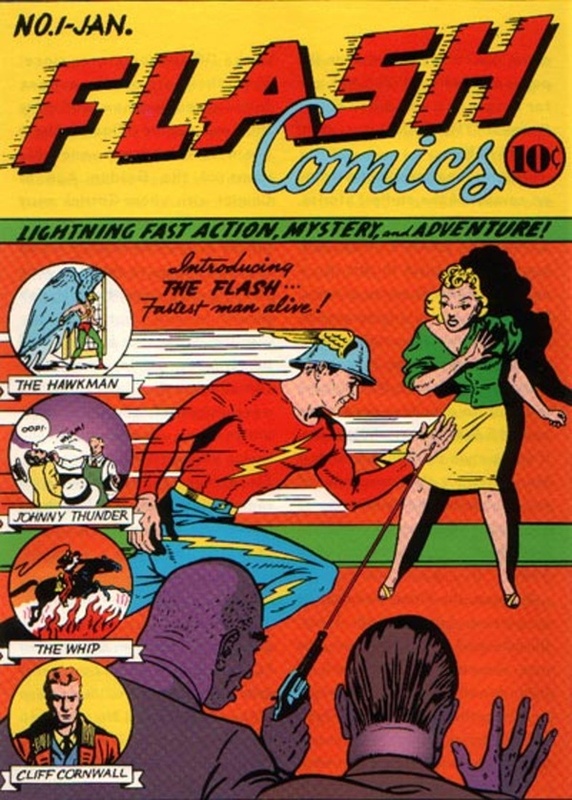 All-Flash ceased publication with issue #34, December 1947-January 1948. Flash Comics ended its run with issue #104, February 1949. The Flash continued to appear as a member of the Justice Society of America until All Star Comics #57, March 1951. The title was then retitled All Star Western and the Justice Society of America no longer appeared in its pages. The Flash--or at least a Flash--would not be absent from comic books for long. Only a little over five years after Jay Garrick's last appearance as The Flash in All Star Comics, editor Julius Schwartz assigned writer Robert Kanigher and artist Carmine Infantino to create a new version of The Flash. The new version of The Flash was police scientist Barry Allen, who while working late one night is splashed with chemicals and struck by lightning. He learns that he can now move at super-speed as a result. In fact, he can even vibrate his molecules at high speed. He took the name "The Flash" after his favourite comic book character (The Golden Age Flash, Jay Garrick). This new Flash first appeared in Showcase #4, October 1956. Sales for that particular issue proved to be so good that The Flash would appear in a few more issues of Showcase before being given his own title, The Flash. Fittingly enough The Flash took up the numbering of Flash Comics, starting with issue #105, March 1959. The new Flash proved so successful that National Periodical Publications also created new versions of a number of their Golden Age superheroes, including Green Lantern, Hawkman, The Atom, and so on. In fact, the first appearance of Barry Allen in Showcase #4, October 1956, is considered the beginning of the Silver Age of Comic Books. While the origin of The Silver Age Flash established that The Golden Age Flash was only a comic book character, Jay Garrick would appear again in the pages of comic books. 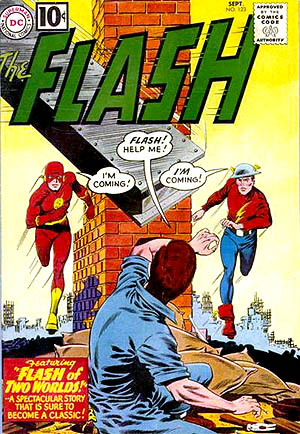 The Flash #123, September 1961 featured the story "Flash of Two Worlds", which would be Jay Garrick's first appearance in a comic book in a little over ten years. In the story Barry Allen, performing tricks for children at a charity event, vibrates his molecules in order to disappear and finds himself transported to another reality (later called "Earth Two"). It turns out that in this reality Jay Garrick--The Golden Age Flash--actually exists. The two Flashes, Jay Garrick and Barry Allen, then team up to battle three of The Golden Age Flash's old enemies: The Shade, The Fiddler, and The Thinker. The response of fans to "Flash of Two Worlds" was very good. Both older fans who remembered Jay Garrick and younger fans for whom he was a new character wanted to see more of The Golden Age Flash. Jay Garrick then appeared again in The Flash #129, June 1962, which would also mark the first time the Justice Society of America was ever mentioned in the Silver Age. The Justice Society of America itself appeared for the first time in over twelve years in The Flash #137, June 1963. Thereafter Jay Garrick would make regular appearances in comic books during the Silver Age and in the Seventies, both in the pages of The Flash and as part of the Justice Society of America in their regular team ups with the Justice League of America. Since that time Jay Garrick has appeared in various comic books over the years. He appeared as part of the Justice Society of America in the short lived revival of All Star Comics in the Seventies. He also appeared in issues of All-Star Squadron, a comic book set in World War II, in the Eighties. Starting in the Eighties he appeared as one of the supporting characters in The Flash, the title starring the third Flash (Wally West, who had been Kid Flash when Barry Allen bore the title). As might be expected Jay Garrick appeared in various revivals of the Justice Society of America through the years, including the short lived Justice Society of America in the Nineties and the somewhat more successful JSA and Justice Society of America in the Naughts. While the original Flash may not be as well known as Superman, Batman, Wonder Woman, or even his Silver Age counterpart, his impact on comic books is perhaps as great. The Flash was the first character in what became a superhero archetype, that of the the hero whose sole power is super-speed. Every super-speedster ever since, from The Silver Streak to Quicksilver of Marvel's Avengers, then owes The Flash a debt. As one of the most popular characters of the early Forties, The Flash insured the popularity of the Justice Society of America in the pages of All Star Comics, thus establishing the trope of the superhero team. In a roundabout way The Flash of the Golden Age was even responsible for sparking the Silver Age of Comic Books. After all, had Jay Garrick never been created, then neither would Barry Allen, the Silver Age Flash. Of course, had the Silver Age Flash never been created, it is questionable if DC Comics would have ever rebooted any of its other Golden Age characters. Perhaps the Silver Age would have taken place had the original Flash never been created, but it would have been very, very different. Although the average person might not know who the Golden Age Flash is (or even that there was a Golden Age Flash), he is one of the most important characters in the history of comic books. Today animated feature films are not a rarity. Indeed, they are nearly ubiquitous. Even animated feature films based on fairy tales are fairly commonplace. A very good argument can be made that the Walt Disney empire was built upon animated movies based on well known fairy tales and children's stories. It is perhaps for this reason that we tend to take Disney's Snow White and the Seven Dwarfs (1937) for granted. It is true that most people know that it was not only Disney's first animated feature film, but the first American animated feature ever. What many people might not realise is that it is also still one of the highest grossing films of all time when adjusted for inflation, and in many ways it revolutionised the movie industry even beyond its status as the first American animated feature film. Walt Disney began his animation career in 1920 when he and Ub Iwerks founded Iwerks-Disney Commercial Artists in Kansas City, Missouri. Iwerks-Disney Commercial Artists did not last long, nor would Mr. Disney's next company, Laugh-O-Gram. It was following the failure of Laugh-O-Gram that Walt Disney relocated from Kansas City to Hollywood where Walt Disney and his brother Roy founded the Disney Brothers Cartoon Studio on 16 October 1923. The Disney Brothers Cartoon Studio would evolve into what we now know as the Walt Disney Company. Renamed the Walt Disney Studio in 1926, the company found success with a series of animated shorts featuring Oswald the Lucky Rabbit. Unfortunately, Disney lost control of Oswald the Lucy Rabbit to their distributor, Universal Pictures. It was after the loss of Oswald that Disney found success with a new creation, an animated character called "Mickey Mouse". Disney followed his Mickey Mouse shorts with another series of animated shorts, "Silly Symphonies", in which music proved a key role. The "Mickey Mouse" shorts proved to be a phenomenal success. While the "Silly Symphonies" series were not nearly as successful as Mickey Mouse, they also proved very popular. It was then in the early Thirties that Walt Disney began contemplating the production of a full-length animated feature film. Walt Disney considered Babes in Toyland for the subject of his first feature, but a feature film based on Victor Herbert's operetta was already in development at RKO. Adaptations of Rip Van Winkle and Alice in Wonderland were also considered. Ultimately Mr. Disney settled on an adaptation of Snow White and the Seven Dwarfs as the subject of his first feature film. Walt Disney's choice of Snow White and the Seven Dwarfs actually stemmed from an earlier film based on the fairy tale. In 1916 Famous Players-Lasky released a film titled Snow White, based on Jessie Braham White's 1912 Broadway play Snow White and the Seven Dwarfs, which in turn was based on the fairy tale. Both the play and the film starred Marguerite Clark in the title role. Walt Disney had seen Snow White at the Kansas City Convention Centre in 1917. As one of the first feature films Mr. Disney had even seen, the film left an impression on him. It was then in 1934 that Walt Disney announced to his animators that they would be making a feature film based on the fairy tale "Snow White and the Seven Dwarfs". It was in June 1934 that Walt Disney made public his plans to make his first feature film through The New York Times. To say that Mr. Disney's announcement of his first animated feature film was met with scepticism from the film industry would be an understatement. The project was soon labelled "Disney's Folly", with many in Hollywood convinced that it would fail. Even his brother Roy and his wife Lillian had little faith in the project and both actively tried to discourage Walt Disney from pursuing it, with Roy pointing out the sheer cost of an animated feature. Indeed, Walt Disney estimated that Snow White and the Seven Dwarfs would cost $250,000, which was ten times as much as his average animated shorts cost. As it turns out Walt Disney dramatically underestimated the cost of producing the feature. The budget for Snow White and the Seven Dwarfs eventually grew to $1,488,422.74. With financing proving difficult to find, Walt Disney had to mortgage his house. Snow White and the Seven Dwarfs did not simply take a large amount of money to make, it also took a good deal of time. Production appears to have begun on Snow White and the Seven Dwarfs on 9 August 1934 with the goal of completing the film in early 1936. Ultimately the film would not be finished until 1937. According to publicity materials for Snow White and the Seven Dwarfs, 32 animators, 102 assistant animators, 167 in-betweeners, 20 layout artists, 25 background artists, 65 effects animators, and 158 inkers and painters were involved in the making of the film. Snow White and the Seven Dwarfs was completed in 1937. It premiered at the Carthay Circle Theatre in Hollywood on 21 December 1937. The audience, which included such well known personages as Charlie Chaplin and Marlene Dietrich, gave the film a standing ovation. Snow White and the Seven Dwarfs also received widespread acclaim among movie critics. Frank S. Nugent in The New York Times wrote of the film, "The picture more than matches expectations" and "Nothing quite like it has been done before; and already we have grown impolite enough to clamour for an encore. Another helping, please!" In Variety John C. Flinn, Sr. stated, "There has never been anything in the theatre quite like Walt Disney’s 'Snow White and the Seven Dwarfs', seven reels of animated cartoon in Technicolor, unfolding an absorbingly interesting and, at times, thrilling entertainment." Walt Disney even appeared on the cover of the 27 December 1937 issue of Time magazine. 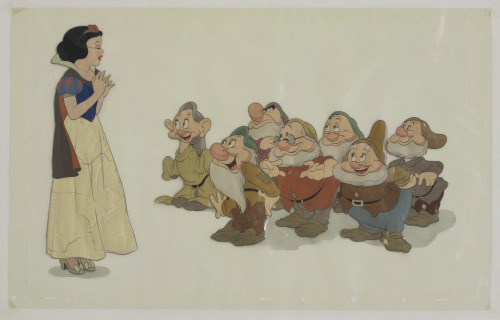 The film industry, including many who had deemed the project "Disney's Folly", also showed their appreciation for Snow White and the Seven Dwarfs. At the 10th annual Academy Awards held in 1938 the film was nominated for Best Score. Surprisingly, "Some Day My Prince Will Come" was not nominated for Best Song, even though it has since become a standard. At the 11th annual Academy Awards held in 1939 Walt Disney was given an honorary Oscar consisting of one full-sized award and seven smaller ones. As appreciative as critics and the film industry and movie critics were of Snow White and the Seven Dwarfs, the general public was even more appreciative. After playing exclusive runs at theatres such as Radio City Music Hall in New York City, Snow White and the Seven Dwarfs went into general release on 4 February 1938. By May 1939 it had already made $6.5 million, making it the highest grossing film of all time. Snow White and the Seven Dwarfs was soon overtaken by Gone with the Wind for the highest grossing film of all time, but to this day it remains one of the all time biggest money makers. Snow White and the Seven Dwarfs is still the tenth highest grossing film of all time when adjusted for inflation. As the first American animated feature film film Snow White and the Seven Dwarfs certainly had a lasting impact. The film took Walt Disney Productions from a maker of animated shorts to one of the major studios in Hollywood. In fact, it was with the profits from Snow White and the Seven Dwarfs that Walt Disney Studios in Burbank, the company's headquarters to this day, was built. Of course, the success of Snow White and the Seven Dwarfs was responsible for the release of every single Disney animated feature film ever since. From Fantasia and Pinocchio in 1940 to Frozen in 2014, none of them would have been possible without Snow White and the Seven Dwarfs. Snow White and the Seven Dwarfs would also provide the template for many Disney features to come; namely, the adaptation of classic fairy tales. Snow White and the Seven Dwarfs would be followed by Cinderella (1950), Sleeping Beauty (1959), The Little Mermaid (1989), Beauty and the Beast (1991), and many others. Snow White and the Seven Dwarfs would also lead other animation studios to make their own feature films. Disney's long time rivals, Fleischer Studios, released their first animated feature, Gulliver's Travels, in 1939. Snow White and the Seven Dwarfs would even have an impact on live action films. It was because of the early success of Snow White and the Seven Dwarfs that MGM decided to go forward with a live action adaptation of L. Frank Baum's The Wonderful Wizard of Oz, simply titled The Wizard of Oz. Besides being one of the highest grossing films of all time and the first American animated feature film, Snow White and the Seven Dwarfs is also important in film history as one of the first movies in which merchandising was an important part of its marketing plan. Even before the film had been released Walt Disney planned what was then an extensive merchandising campaign for the film. A newspaper comic strip adaptation of the film, simply titled Snow White, was distributed to newspapers by King Features Syndicate from December 1937 to April 1938. Snow White and the Seven Dwarfs would also be the first film to have a commercially produced soundtrack album. Among the Snow White and the Seven Dwarfs merchandise made in 1938 were radios, banks, books, dolls, games, and much more. In a New York Times editorial, "Prosperity Out of Fantasy", published on 2 May 1938, it is stated that "Figments of Disney’s imagination have already sold more than $2,000,000 worth of toys since the first of the year." Four decades before the release of Star Wars, Walt Disney pioneered movie merchandising with Snow White and the Seven Dwarfs. There can perhaps be no greater measure of the influence of Snow White and the Seven Dwarfs than the impact the film has had on the public's perception of the original fairy tale. Indeed, in the original fairy tale as told by the Brothers Grimm, not only did the dwarfs not have names, they did not really have individual personalities either. The names by which many, perhaps most, people know the dwarfs by today (Doc, Bashful, Sleepy, et. al.) were creations of Walt Disney Productions. While Snow White's biological mother appears at the start of the fairy tale, she is entirely omitted from the film. Similarly in the fairy tale Snow White is not awakened by a kiss from the Prince, but instead by her coffin being moved (thus dislodging the piece of poisoned apple from her throat). Disney's version also differed from the original story in many other ways. Despite this, today if someone is asked to tell the story of "Snow White and the Seven Dwarfs", chances are good that they will relate the Disney version rather than the Grimms' version, right down to the names of the dwarfs. Snow White and the Seven Dwarfs proved phenomenally successful upon its initial release, paving the way for many animated feature films to come. It also pioneered movie merchandising years before it would become commonplace. What is more, the film continues to be popular to this day. to. Even now, seventy seven years after its release, merchandise for Snow White and the Seven Dwarfs is still being made. Indeed, it is quite possible that Snow White and the Seven Dwarfs could be the most famous film adaptation of a fairy tale of all time.